Japanese is made up of 3 types of sub-languages. Hiragana, Katakana and Kanji, an advanced study concept (it comes with a 1000+ characters, based primarily after Chinese characters). Sometimes all writing is referred to as Kanji. It is important to start, as most children do, with Hiragana. There is a fourth option that people are tempted to use and cannot be relied upon for actual usage by anyone in Japan. Most signs are either in Hiragana or Katakana or a combination. That fourth option is called Romanji and it is a Romanization of the sounds made by the characters, as a westerner would hear it. 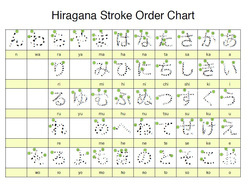 The basis for the entire Hiragana chart are the vowel sounds which are repeated for each consonant pairing. A (Ah, as in ball), I (EE, as in greek), U (ooh, how pretty), E (as in echo), and O (as in open). Say it with me now, Ah, EE, OO, Eh, O (Now repeat it about 20 times until it just rolls out of your mouth). The letters in Japanese should be read from Right to Left as that is the way they read there. (Technically it should also read up and down.) After you have mastered how things should sound, you simply add in the consonants. It is important to note that each character by itself has a meaning and combinations of the characters derive new meanings. For instance, ao (ah-oh) means blue and ai (ah-ee) means love while au (ah-ooh) means to meet. Vocabulary for Hiragana will be on another page. Depending on the word in Japanese, the sounds may either blend or sound exageratedly separate. As in America, some people slur their sounds as well. Women and men over in Japan have different sound expectations. Men's voices are either slightly effeminate or very jagged and seemingly loud, though too loud is strongly discouraged unless someone is in a rage. Women's voices are almost expected to be higher and light and very effeminate. Not everone fits this bill, but when you listen to different programs on the web, like google.translate.com, you can hear the distinct sound and how the different genders are expected to sound to others. In Japan, men are not considered necessarily gay or straight based on appearance and there are no true stigmas for looking effeminate there. Often young women there admire a man who looks what we might consider teen-y-bopper-ish here or even slightly more like a woman. If you are off-put by these images, then Japanese and their culture might not be right for you. Japanese Manga are continuing stories which engage the characters in comic form. Anime is the cartoon version of this. People who fall in love with or are addicted to the Manga or Anime culture are referred to as Otaku. It is considered an insult by some, though here in America, it can be considered part of a larger fan-base culture. If you have ever heard of or been to ComicCon, you are most-likely an Otaku of some sort, though many cartoons were made here in the USA. Superman, Batman and many other American heroes are not Anime. They are comics which were brought to the screen. The difference is where they were made, mostly. One of the most well known animators in our day is Hayao Miyazaki who has partnered his studio (Ghibli Studios) with Disney's Animation crew. This is only to bring the existing films and new ones going forward to American (and other countries/cultures) audiences by re-dubbing them in English. Most of the Anime credit, if not all, belongs to Hayao Miyazaki's crew at Studio Ghibli while Disney gets distribution and voice talent recognition.